These amazing, buttery cinnamon rolls are perfect for a holiday morning or special family breakfast because they're made ahead of time and frozen until you're ready to bake and enjoy them. The dough is soft and buttery, similar to a brioche, so a stand mixer is ideal. Spread the easy cream cheese topping on the warm cinnamon rolls and enjoy! In the mixing bowl of a stand mixer with dough hook, combine the instant yeast with the lukewarm water. Let stand for 5 minutes. Add the dry milk powder, bread flour, all-purpose flour, granulated sugar, 2 teaspoons of vanilla, if using, baking powder, salt, and egg. Mix with the dough hook until the dough comes together and climbs up the dough hook. Knead with the machine for 3 minutes. Add the butter, a few tablespoons at a time. It will take several minutes to incorporate the butter, and you might need to break the dough away from the dough hook with a spatula from time to time. When the butter has incorporated fully into the dough (it will be batter-like), continue with the kneading, adding enough flour in to coax the mixture off the sides of the bowl. Knead for about 6 minutes longer, until smooth and shiny. Line a 13x9-inch pan with parchment paper. Press the dough into the pan. Cover with plastic wrap and let rest at room temperature for 45 minutes. Refrigerate overnight. Next morning, butter a 13x9-inch baking pan. Remove the dough from the refrigerator and let stand at room temperature for a few minutes to take the chill off. In a bowl, combine the brown sugar and cinnamon. Roll the dough out lightly to an even rectangle, about 15- x 1- inches. Spread the 6 tablespoons of softened butter over the dough to within about 1/2 inch along the long ends. Sprinkle with the brown sugar and cinnamon mixture. Starting at a long end, roll up. Cut into 12 pieces, about 1 inch or slightly more in width. Place the slices in the buttered baking pan. At this point, you may cover the pan with foil and freeze for up to 1 month or continue with the baking. If the rolls were frozen, take them out of the freezer about 1 1/2 hours before you plan to bake them. Bake the rolls for about 25 to 35 minutes, or until golden brown. Combine the icing ingredients and beat until smooth, adding just enough milk to make them the right consistency for spreading or drizzling. 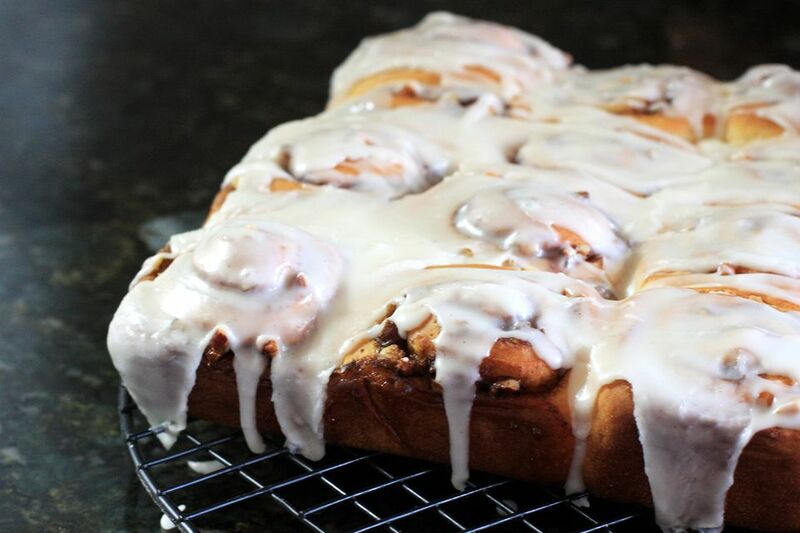 Spread or drizzle icing over the warm cinnamon rolls.